Los Angeles (AP) – And so, fellow moviegoers: Ask not what your country can do for you. Ask what Tom Cruise can — and will — do for you. One day, if this continues, it will surely seem silly. One day, people will chuckle sympathetically at the exploits of this well-meaning but wrinkled movie star, perhaps in his 80s then, putting his life in danger to please his fans. Now, though, is not that day. 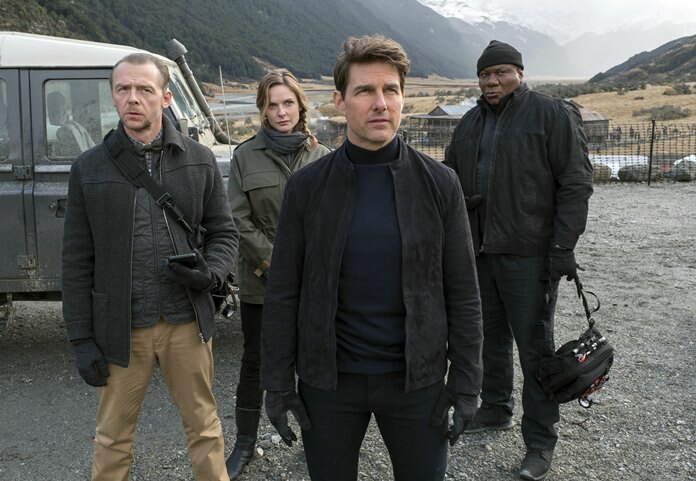 With his partner, returning director-writer Christopher McQuarrie, Cruise delivers all the above in the ridiculously entertaining “Fallout,” his sixth outing as Ethan Hunt. We begin, as always, with a new mission — this time, it arrives in a hollowed-out copy of Homer’s “Odyssey,” perhaps a reference to Hunt’s own journey. We’ll try to boil it down: The evildoers are the Apostles, terrorists who aim to nuke the world’s top religious sites — the Vatican, Jerusalem and Mecca — and bring on an apocalypse. They’re in league with Solomon Lane (Sean Harris), the criminal mastermind from the last film, who stayed alive and now wants revenge against Hunt, not to mention the global destruction thing. Hunt must get his hands on three missing plutonium cores. He actually manages this, for a second — but has to give them up to save a cherished team member. Thus is launched an overarching dilemma of this installment: Should Hunt save one life that is dear to him over millions of others? We don’t get much time to ponder. Hunt has to start from scratch. His IMF team includes, as always, loyal Luther (Ving Rhames), and tech whiz Benji (the wonderful Simon Pegg), who provides needed levity. It’s safe to say that never before has Benji’s life hung so precariously in the balance. IMF secretary Alan Hunley (Alec Baldwin) is back, clashing with Erika Sloane (Angela Bassett), certainly the most stylish person ever to head the CIA, onscreen or off. Sloane forcibly injects her own agent, the very handsome but shady Walker (Henry Cavill), into Hunt’s operation, causing all sorts of complications. Crucially, we also have former MI6 agent Ilsa Faust (Rebecca Ferguson, who made such an impression in the last film). She’s back, but working for whom, exactly? Regardless, it’s fun to watch her take down a succession of brutish men. A welcome newcomer is Vanessa Kirby (“The Crown”) as the mysterious White Widow. Of course, it’s the stunts that really matter. And the scenery. Paris has always been beautiful, but there’s a certain frisson you get when arriving with Cruise by way of a plummet from a plane onto the roof of the Grand Palais. And that motorcycle chase around the Arc de Triomphe? Let’s just say that getting through that traffic circle alive on a real-life day is a Mission: Impossible. Then we’re off to London, where Cruise shattered his ankle bone filming a rooftop chase. At a recent screening, McQuarrie explained that most of what we see the actor doing here, including that sprint, was done after the injury. Feel free to consider that as you watch. The most dramatic stunts were filmed in New Zealand, standing in for Kashmir. Many people go bungee-jumping there; probably relatively few do it from a moving helicopter. We also see Cruise piloting another helicopter into a seemingly irreversible plunge. A climactic physical fight was shot in Norway, on a cliff that drops into a fjord. And Cruise’s 25,000-foot jump from a plane was filmed in Abu Dhabi. Much ink has been spent analyzing this enduring phenomenon called Tom Cruise, and what motivates him, onscreen and off. “I just want to entertain people,” he said recently. That’s one mission he can still nail. “Mission: Impossible – Fallout,” a Paramount Pictures release, is unrated by the Motion Picture Association of America. Running time: 147 minutes. Three stars out of four.